HomeReforming the Senior Civil Service – what do you think? Reforming the Senior Civil Service – what do you think? The #GreatWestCoastRailShambles has raised again the issue of the competence, or otherwise, of the Senior Civil Service. Ministers are blaming the mess purely on civil servants, whilst others are pointing to a flawed policy. Without a lot more information, it’s hard to know how much of each was involved. But it certainly gives even more ‘edge’ to current project to re-examine the relationship between Ministers and Mandarins commissioned by Cabinet Office minister Francis Maude. The contract was awarded to IPPR, with me participating in the project (see here). Given my involvement, I am not at the moment going to comment on how to reform the Senior Civil Service – although what I have said in the past is available on this blogsite and on the sites of the Public Administration Select Committee and the House of Lords Constitution Committee, both of which I have been an expert witness for. What I want to ask you, dear readers of Whitehall Watch, is what do you think? – About the accountability and competence of the SCS in Britain? – About the accountability arrangements and skills and competences of senior public servants in other countries? Answers with a comment please! If you want to make an anonymous comment you can always email me (colin.talbot@mbs.ac.uk) and I will post the comment for you. Reviews by the Institute for Government and others consistently identify one of the Civil Service’s greatest assets to be the commitment of its senior people. Over 80% of senior civil servants are proud to work for the government. However the Capability Reviews highlighted that there are weaknesses in the way that the Civil Service manages performance. Institute for Government work suggests that other successful countries make more frequent use of a wider range of interventions and sanctions which include eliminating underperforming programmes, budget reductions and pay or career consequences for senior officials. 1. Clearer organisational benchmarking, including through the publishing of departmental scorecards and benchmarking the UK Government to learn from the very best internationally. 2. Efficient location and modern working practices, including a new drive on doing more work outside London and modernising working practices. 3. Reducing bureaucracy and unnecessary management layers, including identifying scope to consolidate management spans with potential to make savings on Senior Civil Service numbers. 4. Stronger SCS performance management, including putting in place new performance management for Senior Civil Servants, through promotion assessments and a greater role for non-executive directors in managing performance. Also, haven’t we been here before, and on a number of occasions, including a ‘Rethinking Whitehall’ study by the IPPR in 2005? So, at some point there is a need to examine tactical choices in the design and implementation of civil service reform – what factors determine whether it succeeds or fails? I am not an expert nor particularly well informed on political structures. My general approach is that politicians (of all stripes and levels) are not to be trusted (ever) and civil servants must be mad to work closely with them and really senior ones certainly will have their own agenda which may be hidden. My starting premise re blame is probably half a dozen of one and six of the other – but the politicians will tend to take more when push comes to shove cos they are the ones ‘in power’ and should have their fingers on the pulse. All managers should know their staff, their respective capabilities and weaknesses and must take the blame when things go pear-shaped. Laws, strategies, statutory instruments and all the other stuff that comes out of government should be written in plain english and accessible to the ordinary person in the street if accountablity is to be real. They hide behind ‘shall vs may’ to make things look better and then you find the ‘may’ means they don’t actually have to do what they say in whatever. Since civil service activities are part of the government services to us – the people – this study should encompass accountability of government to us – the people. We really need to wait to judge what happened on the rail franchise. But as a general point there is a confusion of accountabilities inherent in the way we traditionally develop policies and programmes which is broadly collaborative between ministers and officials. In my view this is a strong model and better than a more contractual approach tried in some other countries. We could strengthen our arrangements by borrowing from standard project management procedures and having customer/ministerial sign off with formal change management processes. This is the conclusion the Better Government Initiative has come to and will include in our forthcoming report. I hope this will be available in time to feed into the IPPR work. I have not followed this closely, but IF a significant constitutional change is envisaged in the relationships between ministers and senior civil servants, then real evidence should be produced to document the extent and the nature of the (alleged) problems. To change something so fundamental, and culturally embedded, without a detailed diagnosis and closely argued case would be irresponsible. Thus far all I have heard is that some ministers in the current government feel they have not been supported enthusiasticaly enough in some (unspecified) policies. I hope your study can raise the debate above this kind of childishness. There are many precedents to think about – the one that comes to me is Tony Benn’s accusations that his wonderful policies as a minister in the late 1970s had been sabotaged by conservative-minded mandarins, who had plotted against him. As far as I know this was a complete fantasy, and most people who have studied the matter now agree that the policies in question were daft – and seriously wasteful of public money. Benn pretended this was a plot against radical left wing policies. Now we are hearing of a quasi-plot against radical right wing policies. Ho hum. A slightly tangential response; one that goes more to the ‘accountability arrangements’. In fact, now, the performance of a chief executive operates around a much more diffuse, varied and appropriate range of mechanisms. Too involved to go into detail here. But it relies on several mechanisms, including annual letters of expectation from the responsible minister and the state services commissioner but which refer to a wide range of matters including ministerial priorities, medium-term objectives, and ongoing implementation arising out of ongoing reviews (such as the Performance Improvement Framework, initiatives arising out of the Better Public Services process and so on). Yes, there is still an output agreement but, along with the Statement of Intent, that’s more part of the general budget process. The important point here is that I suspect that ministers and others in Britain carry around a belief that the old NZ approach wherein the minister specified desired outcomes and a contract of form (‘purchase agreement’) then specified the outputs (quantity, quality, cost, timeliness, location) to be produced by the agency, for which the chief executive would be held accountable, still applies. It doesn’t and hasn’t for a while. For what it’s worth, in my view, it was never going to survive. It was a ridiculously simplistic way of trying to capture the essence of a fundamentally complex relationship within the executive which the participants would eventually come to realise. That has indeed happened. Whilst the mechanisms for maintaining accountability in NZ still leave a lot to be desired, the bit that expresses the relationship between chief executives, ministers and the state service commissioner are now significantly more appropriate than the version applying in the late 1980s and 1990s. It is worth pointing out that what you describe is remarkably similar to what happened to the simplistic Minister-Chief Executive relationship supposedly promulgated by the UK ‘Next Steps’ agencies. I have examined this in several publications and pointed out the reality of a complex web of accountabilities. c. though ministers have informal influence they have no formally recognised levers for rewarding or sanctioning civil servants. f. even where individuals are rewarded or sanctioned, a lack of transparency means others doubt it would happen to them. b. there is no effective mechanism for injecting ambition, urgency and focus where the underlying goodwill of officials is insufficient to navigate complexity, vested interests and resistance to change. c. advice were assessed not only immediately, on what the consequences were expected to be, but later on, in the light of what consequences actually emerged. I quit the Civil Service many years ago, it seemed a dead trade, too constrained, too subject to arbitrary decisions. One never really knew who one was truly working for or why. Later I met senior Civil Servants professionally, a phrase that sticks in mind is ‘Oh, we only hire consultants for someone to blame’. The key is not to get stuck with the blame when, as so often, plans go wrong. I should say the central problem is that the Civil Service is stuck in the middle of ‘say one thing, do another’ politics. Not so bad when the economy is growing. Then good things can be done. But there has been little progress for well over ten years and the senior’s job seems a rotten one now – managing presentation and trying to keep their chair warm. I am glad I got out and I would advise any bright young person to avoid the Civil Service like the plague. Think carefully about who you are working for – do you trust them – do you know who they are? I am getting in touch to draw your attention to a relatively recent paper I prepared for the NIA’s Finance and Personnel Committee. I’m not highlighting it because it’s particularly amazing, just that the New Zealand approach of offering a form of natural justice right of reply by officials in relation to parliamentary committees is rather different from how things currently work here – and when I was briefing members, there was some concern about the idea of select committees operating in a quasi-judicial manner and holding conduct-type hearings. Where is this place of Dutch descent where things are so clear and cut and dried? If you have security of tenure, you are possibly likely to be more independent, more objective and more able to stand up to influence from Ministers or anyone else. However, this tenure should be reviewed more rigorously than is currently the case. If you work in an institution that is seemingly inviolate, you can do what you like. There is seemingly very little accountability. Everyone knows each other, protects one another and deals happen in corridors. The world outside is the enemy, always criticising us, or not aware of all the facts and accusing civil servants of not supporting them. The senior civil service is a club, and a very powerful one. It does not have pace, or much passion in the face of cuts, and pride in the brand is diminishing fast. Vested Interests and their organisations are inherently pleased with themselves. However, the impression is that some Whitehall departments are “gentlemen” and others are “players”, so there can be bitterness between departments. EU procurement law is treated by UK civil servants as making them act in the blue corner, while the nation’s wannabe suppliers are in the red. The ensuing confrontation, fear, law-watching, gold-plating do not improve the chances of successful outcomes. If you have security of tenure, you may not be afraid to make terrible mistakes, as you will always still have a job. Was Clive Ponting the last civil servant to be dismissed ? It is rare to hear of anyone mentioning the responsibility word. Ministers and their civil servants pass the buck, or claim out-sourcing is to blame. A process designed in 1853, or nearby, is probably not going to be completely fit for 2012. The civil service in the UK is home for an elite, like the Houses of Parliament and elites are rarely challenged, and do not tend or choose to give away power. This might be a developed country debate, but interestingly enough what is coming through is not very different from what I gathered in my current research on influence of politicians on public sector reforms in Kenya. In the interview among other questions, I asked specifically if the respondents thought that ‘Senior Public Servants were qualified to perform the duties of the positions they had been appointed to by the politicians. This comes from the background that in Kenya a number of the senior positions- Permanent Secretaries and equivalent are held by former academics (Professors on sabbatical, PhDs and a minimum of Masters Degree holders. The answers were varied but more telling were responses ‘that indicated that “Academic qualifications and private sector experience were not necessarily a good benchmark for performance in the civil service. They said that the civil service having developed over a period of time, needs to “rediscover” its sense of identity and pride. That civil servants were for a long time known to be ‘professionals- in the true meaning of the word. That what the public sector needs among other things is to revamp the ‘the spirit of comradeship’, Esprit de Corps of the public service- which has been lost due to the on-going changes and bringing in of many ‘experts’ from outside the service (Probably referring to NPM reforms). The civil service has lost a sense of togetherness, therefore civil servants nolonger feel as belonging to a body or have a sense of pride to protect! There is nolonger peer pressure compeling public servants to excel or conform to standards. The civil service management trainings (for promotions) at each grade created a sense of togetherness as the recruits rose through the ranks. The performance contracts and the individual contracts rule. It is everybody on their on. As a ‘body’ civil servants can fight some of the excesses or political interference! As individuals they are likely to succumb to the Minister in-Charge individually. After all most of them are on short contracts, and what most of them do when they feel the working relationship with the Minister is nolonger bearable is to terminate or cut short their contracts and go back to whichever institutions they came from. That does not in any way help in identifying the root cause of the problem, which remains and is perpetuated. The decision of the public servant to terminate their contract as it also happened in Kenya a few weeks ago, is a sure indication that incase of a disagreement in most cases it is the ‘Public Servant’ who must throw in the towel and not the POLITICIAN. Kenya has now gone to the other extreme by borrowing a mixture of the British and the American Systems – where Cabinet Secretaries (Ministers) will not be Members of Parliament and Principal Secretaries (Permanent Secretaries) will be competatively recruitment come 2013 after the election and formation of the new government in March. All these are meant to tame what was perceived as undue “Political Influence in the appointments and hence implementation of policies. The verdict and impact of this is however yet to be evaluated. In a past role I prepared briefing for a Perm Sec’s performance review with the Head of the Civil Service and as far as I can see this really was a cosy chat plus a chance for the Perm Sec to publicise his (and his department’s) more praiseworthy achievements (while discreetly glossing over any negatives). Associated with this, it really is difficult for the Whitehall centre to hold senior civil servants fully to account – the subject matter is just too wide-ranging, complex and specialised. NAO make a good stab but all civil servants who have been involved with NAO must know of cases where they have not found all the skeletons in the cupboard. Secondly, successful senior civil servants are often very comfortable with ambiguity and dealing with situations with lots of potential for developing in different ways. This allows them to change tack quickly and comfortably if they need to. (You may or may not think this is a good thing). 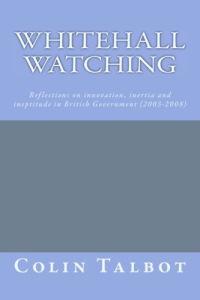 There are lots of example of senior people recruited from outside the civil service who fail to flourish in an environment of ministerial whims, reshuffles, political expediency and “events, dear boy” combined with multiple overlapping and inconsistent holding to account (through head of department, Ministers, Select Committees, and all manner of internal and external reviews). I’m sure Whitehall needs these people but I’m not sure how it can retain them. Next Steps was a possibility but doesn’t really exist any more (and is inconsistent with the bonfire of quangos). 1. There is a debate to be had as to what we mean here by accountability? Is it that we want to see heads roll more often? Is that a good model of accountability to have? 2. The Accounting Officer role seems to be unfit for purpose. No one person can account for everything and retaining the position reinforces the lack of accountability (cf Sir Bob Kerslake’s evidence to the PAC on the FiReControl debacle). 3. The move towards having a ‘board’ in ministerial departments is a good sign, but the board must be given the ability to make decisions (rather than advise as is currently the case). Really key decisions can be retained for the minister, but the board could take the role that an Accounting Officer does at the moment. 4. Moving to a ministerial-SCS ‘contract’: the current model may not work well, but this system would just be replacing bad with worse: more heads may roll, but this will simply make the turnover at the top even greater than it is now and may stymie decision-making as no-one wants to be left holding the can. As soon as politicians get involved, the ‘blame-game’ gets more intense and, as happens now in the Arm’s Length Body sector where the minister does have the power to hire and fire, the losers are unlikely to be the politicians. 5. There needs to be a recognition that the risks in government are enormous and things may go wrong. Unfortunately, no politician is likely ever to recognise this. However, there also needs to be a recognition that when things go wrong and were preventable, that someone should be disciplined. The normal culprits are: lack of (large) project management experience, lack of financial acumen, turnover of SCS, inability to take a decision until it’s too late to implement it properly. 1. My experience of working with many SCS is that they are highly intelligent but political (with a small p) creatures. Because of this they are often too interested in the ministerial dimension and not on the practical, commercial and delivery aspects of their job. This will continue as long as ‘policy’ is the route to SCS, and fast streamers work in private offices and not on the front line. This prompts some further thoughts. The first question prompted by reports of an apology by a Perm Sec to ministers on the problems with letting the West Coast Main Line franchise is: does this set a precedent whereby we can assume, every time something goes wrong, that the absence of an apology from civil servants implies they are blaming ministers, at least in part? (ii) the absence of incontrovertible technical errors does not logically imply, and therefore should not be taken as demonstrating, the existence of any other form of error or of blameworthy action, by any party. There may therefore be something to be said for civil servants stating up front in the (relatively infrequent, I believe) case when there has been a clear-cut failure. Getting the sums wrong, or giving inaccurate specialist advice, would be examples. Overlooking an obvious factor or piece of evidence might be another. Failure to consult in line with expectation, and incompetent policy implementation could also be on the list. Admitting such problems is part of accountability. Why not be transparent about it? It does not necessarily imply: (i) that other aspects have not been undertaken with heroic dedication; (ii) that ministers are blameless; (iii) that other misjudgements have not been made. Incidentally, while I’m all in favour of there being consequences for blunders – even to contemplating terminating otherwise exemplary careers in extreme cases – the rationale of suspending staff of proven ability for technical errors – or failures of quality assurance – which they are the last people to be likely to repeat seems unclear. (1) We should avoid the sort of accountability which operates by saying since you failed to control this thing which you do not control, you must be punished – but accountability does not have to work like that. There is such a thing as intelligent accountability. (2) Whitehall officials are very rarely fully in control, even of delivering outputs let alone outcomes (very often that is also true in the private sector). However they almost always have influence (or could acquire it if sufficiently motivated). A proper system of outcome-focused accountability should ask officials to account for what they have done to influence the people and factors that affect outcomes. If you are SRO for reducing crime, you should not be in the firing line if a local police force deploys ineffectually, or if schools are lax in allowing disaffected youth to roam the streets rather than attend class, or if rehabilitation programmes are poorly focused. You might legitimately be asked what assessment you have made of the relative impact of these factors, and you might be open to criticism if you have simply classified these as other peoples’ responsibilities, rather than engaging (e.g. within Whitehall) to influence the ones assessed as having most impact on crime reduction. (3) The very real possibility that a policy decision is hindering the desired outcome is a red herring. The tasks of the civil service are always constrained by the policy of the government of the day and one is called to account in the context. Suppose policy is to have more “bobbies on the beat” and the evidence suggests this is inefficient for crime reduction. There is absolutely no necessity why a civil servant called to account for crime reduction within the constraints of existing policy need “drop the minister in it” by declaring that this policy is counterproductive. Sometimes the political context is such that a proposal for a change on policy can be put: civil servants are used to judging this and working within whatever decision is taken. The case where a policy is believed to be an insuperable obstacle to meeting a hard target is a subset of the case where there is a hard target which appears infeasible. In such a case the civil servant is under a duty to advise accordingly, but nevertheless should be accountable for making best efforts to achieve it (within policy constraints). It might be interesting if, in such cases, ministers had a choice among SROs who might be prepared to sign up to differing levels of ambition. This is not the only way of looking at things and no system is without risk. I do believe these are fundamental issues, and hope the debate is active. The question that you pose is interesting. In the old days the makeup of the Senior Civil Service (SCS) were largely public Oxbridge and school types, however, the majority of them had honour, integrity, followed the Civil Service Code, and had the national and public interest at heart. Over the years political intervention has created significant changes to the SCS and the lower grades, and the Civil Service has become extremely political, the senior ranks have become motivated by greed, and it struggles to present itself as being a number of successful corporate commercial organisations – I shall return to this later. The Next Steps initiative saw the creation of agencies, and shortly after that many of those agencies became trading funds. Senior staff SCS staff lying beneath executive status began to feel uncomfortable, were provided targets, became unsettled and threatened as they saw their future career opportunities being filled by outsiders (brought in by politicians). Overnight their futures were no longer guaranteed, and they began to develop strategies to meet targets and survive within this new environment (all else was out of the window – this is a matter of survival). Many saw industry as being the threat, and prepared defensive strategies, whilst others were developing strategies to protect themselves against their new masters, and the politicians. They needed to conceal their failures, needed to meet their targets, and deliver programmes on cost which they previously been hidden by re-defining the goal posts. A clear indication of things going wrong was the consistency and accuracy with which they repeatedly hit their targets. The managers were becoming Corporate Psychopathic Bullies, protecting themselves with mobs of trainee Bullies, who in turn were protecting themselves with seed corn Bullies eager for promotion. The management paths were soon the only paths for advancement, hence, staff that would have struggled along the professional route were now becoming managers. Areas were by now so overspent that staff were committing fraud and locked into their jobs to prevent outsiders from understanding their business. Professional staff were told that this was normal commercial practices, however management professionals brought in from the commercial sector were filled with horror, ignored, Bullied, and thus had to conform to survive. Outsiders like politicians, National Audit Office (NAO) were ushered, so that they only communicated with ‘right people’. The NAO would have been confused by the complexity of the system but convinced that these nice people were doing a good job. In essence the true workings were a closed shop to outsiders, and even the executive. David Kelly, Richard Holmes, and I’m sure many others were Bullied. Staff surveys identify these behaviours. The whole system is operated by the management, and few staff are prepared to step forward because the Bullies control the ‘processes and procedures’, ‘enquiry panels’, and might lose their ‘jobs and pensions’. · Internalising complaints, and appeals, processes to within their organisations. Agency staff are denied access to the Civil Service Commission. · Staff are judged on their behaviours (this is a subjective judgment of managers against which it is very difficult for the Civil Servants to defend themselves against), managers can isolate staff from the work programme, and deny them work. · Internal and external job opportunities are managed. · Agencies create their own grades and associated pay scales. · The agencies creating their own rules regulations and disciplinary procedures. Such processes are poorly defined and are subverted by managers). Since each agency are creating their own processes and procedures this leads results extra cost, and a lack of consistency. Furthermore by internalising the implementation of such processes means that employees have no access to independent appeal. Managers disregard the Civil Service as they believe that it is embraced by their processes and procedures. · Staff who are seen as problems, particularly union officials, are paid generous packages and given none disclosure agreements. Others are denied work, isolated, put into unsuitable positions with causing constructive dismissal, and interestingly the Cabinet Office and government are aiding in this. Civilian Management Services (CMS) have been disbanded and replaced by Human Resource (HR) departments. The difference here is that where CMS managed Civil Service careers, HR is a defence mechanism to protect the management from their employees. The tip of the iceberg began to be exposed by the Bernard Grey report, however all has slowed down, and we have yet to see a solution, and as we know from the Titanic – more is hidden beneath the waterline. I’m sure that the agencies have wined dined and surrounded him with the ‘right people’. As time has gone by, in the interest of increased efficiency, the checks, and balances, have been removed opening up greater dangers. The fundamental problem is, like the banks, the Civil Service cannot be seen to fail (this is why they are not ‘corporate commercial organisations’), however, as Hayek and Schumpeter recognise, businesses need to fail to cleanse their management systems. The only thing we can do is watch and learn from these real life experiments and hope that such knowledge is passed on to future generations. The Civil Service is in terminal decline being eaten from the core outwards. The system is complex to understand what is happening you need to understand the whole apple. Honour, integrity, a sense of fair play, and a devotion to UK PLC is important (perhaps qualities of Oxbridge and Public school life), however, this is now lost and has been replaced with a culture of selfishness (schoolboy behaviours of the masses). There doesn’t seem to be much appetite for radical change. A move in the direction of the French or American models would be unlikely to command widespread support in the UK. The New Zealand model therefore has many attractions – basically similar to the current UK set-up (independent and politically neutral civil service), but with greater emphasis on civil service accountability at senior levels (through fixed term appointments with clear performance contracts) and a sharper focus on policy outcomes. Bill English, the NZ Deputy PM and Minister of Finance, was a convincing advocate of the NZ approach on his recent visit to the UK. I know this sounds like an off topic question; but why don’t we have a Dept of Public Works that oversees infrastructure maintenance and public sector projects? Did we ever have one? It just seems that from my limited African experience this is one of the best ways of controlling a big proportion of spend and quality – provided that the DG is sound and pwerful enough to ward of political interference. We certainly used to have one – the Ministry of Public Buildings and Works existed until the reforms of the 1970’s when it was merged with the Ministry of Housing and Local Government and the Ministry of Transport to form the super ministry – the Department of the Environment. It had a semi-autonomous status there as the Property Services Agency until it was privatised somewhere around 1990-92 – I think- into a joint venture between Tarmac and Black and Veitch(TBV). It has since disappeared without trace so far as I can see. My perception is that its downfall came because it was very large and therefore bureaucratic. It used its purchasing power to get bulk discounts but that made the services it provided monolithic – the same furniture was issued to civil servants whether they were in Balham or Beirut. There was a fashion in the 1980’s for passing spending decisions to the front line in the belief that would get better value as those using services would make sure they got the most out of their budgets. That broke down some of the rationale for a strong central purchasing function for property services and there was a fashion – continuing- for contracting out to the private sector. Interestingly the Coalition Government seems intent on reinventing a strong central control on purchasing and who knows if the wheel will complete the circle. For my sins, I spent a year in the PSA in 1983-84. It had a track record of overruns and overspends on major construction projects, and it treated the other parts of government as unwelcome and ungrateful tenants of its property. It is true that the rump of the PSA was privatised, but in truth the organisation was killed off by its ungrateful customers who wanted to manage their own accommodation and their own building projects. Having said that, i believe the concept of a central agency always had, and still has, many advantages in principle. Thank you. That lack of customer, as opposed to civil, service mentality was what gave Maggie the chance to launch her onslaught on the civil service. All that privatisation and quango stuff was entirely inappropriate, IMHO. All that was needed was a customer-focused, value for money, reward system – and I exclude entirely bonuses!